Steering Wheel Cover Mesh, Orange, 22"
Mesh Steering Wheel Cover. Unlike vinyl covers this cover can be folded and kept in a glove compartment or even your pocket. It can also be washed. Cover is made of a 6 oz open weave ANSI compliant florescent orange polyester fabric, that is both durable and will not lose its shape due to washing. Cover reads: "Danger. Do not operate. This safety cover may only be removed by authorized personnel. 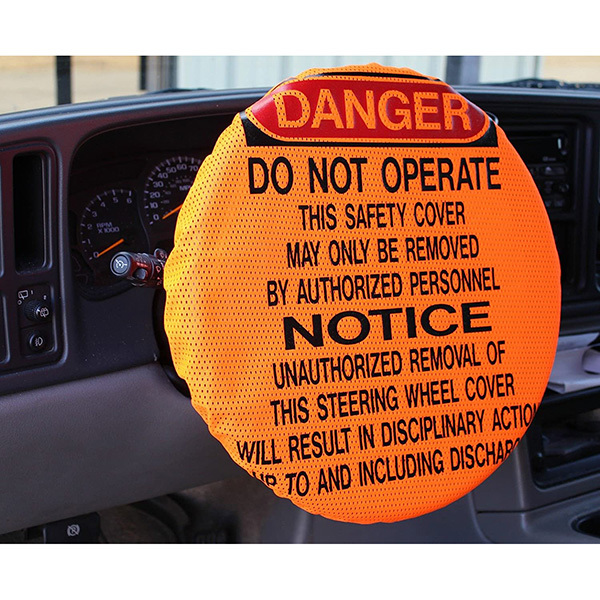 Notice Unauthorized removal of this steering wheel cover will result in disciplinary action up to and including discharge."